A client in Lake Mary, Florida was in need of landscape design ideas including a pergola, brick paver patio, and landscaping. The property needed an outdoor room beside the pool and a patio for entertaining off of the guest house. 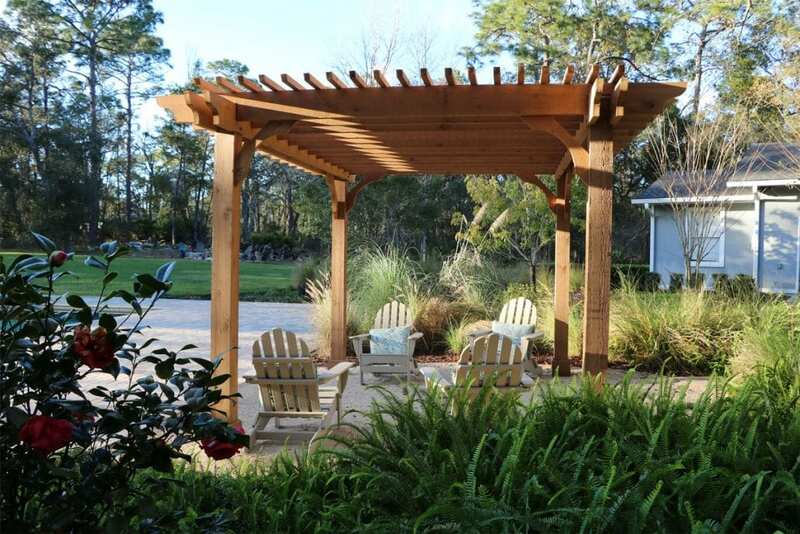 The landscape designer and team members started by carefully installing a western red cedar pergola near the pool deck. This included large 8 x 8 posts and 2 layers of rafters to provide shade. A custom stain was applied to match existing architectural elements as well. This created a cool escape from the pool to relax with friends. Coquina stone was installed around the pergola for a beach like feel. The team continued the Lake Mary, Florida project by carefully installing brick pavers to create a patio near the guest house. Walkways were also installed to provide access to the pool deck and pergola area. The landscape designer then installed a landscape that complimented the existing oak trees and natural setting of the property. This included azaleas and natural groundcovers. Organic mulch was placed around all plants to hold moisture and reduce weeds. The irrigation system was also renovated to accommodate the new landscape. With a new landscape design implemented on this Lake Mary, Florida estate the family will enjoy years of entertaining in their backyard.